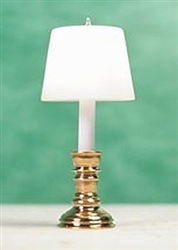 Half inch scale Brass Table lamp with white shade- electric Bi-pin- One light. Measures 5/16 dia x 7/8 inches tall. Shade comes with soft white finish, may be customized with fabric or by painting.